The Israeli Occupation of the West Bank has now entered its 52nd year in 2019. Yet the Occupation remains largely invisible in the Israeli election campaign. Mainstream media coverage of the election (including the left-leaning Haaretz) has to date largely ignored the Occupation as an election story. Election coverage has primarily revolved around near frenzied stories of the rise and fall of political personalities, the drama (or lack of drama) around various political leaders press conferences and the almost daily machinations of political party splits, individual resignations and shifting ad-hoc alliances. Bread and butter issues including a decade of soaring house prices, traffic jams, failing schools are very much secondary. If there is a single issue dominating the campaign it is the question overhanging the political future of Bibi Netanyahu. Will Netanyahu be indicted for corruption? if so, what will the political fall-out be? Can the embattled Prime Minister survive beyond July and overtake David Ben Gurion as Israel’s longest ever serving Prime Minister? Despite a near constant daily backdrop in the news, the Palestinian conflict, the Occupation itself – just as it was in the Knesset election of 2015 – remains a largely invisible story. There are perhaps multiple reasons for this. Put bluntly, the current status quo of the Israeli-Palestinian conflict is acceptable to too many Israelis. The conflict is something that’s happening ‘over there’, somewhere else, down the road, not be seen or experienced. Suicide bombing have long ceased. Life is generally good. Israelis are happy, 11th in the world to be exact. There hasn’t been a meaningful peace process since Ehud Olmert was in power in 2008 more than a decade ago. The political parties on the ‘Centre’ or the ‘Centre-Left’ generally do everything to avoid talking about the issue. The media with a few exceptions has generally colluded in this public indifference. And finally, the Occupation itself, including the lives of millions of Palestinians, has become largely physically invisible in the lives of ordinary Israelis. ‘It’, ‘they’, simply do not impinge on Israeli life. The occupation is largely hidden behind walls, kept at a safe distance. To talk of an ‘Invisible Occupation’ may seem somewhat perplexing to outsiders. To Israel’s many critics, the Occupation itself, simply defines the nation. How, one may wonder, is the Occupation physically or psychologically invisible when the entire country (West Bank included) is not much bigger than the US state of Vermont and smaller than the size Belgium? Yes, it is possible, despite the fact that Israel proper at its narrowest point is narrower than the length of Manhattan. Doesn’t the media report the reality of the daily violence of Palestinian life under the Occupation? No, not Really. A recent UN Report revealed that 2018 was the worst year for Palestinian deaths and injuries in the West Bank and Gaza since the Gaza conflict of 2014. In 2018, 295 Palestinian were killed and 29,000 were injured. In the same year 15 Israelis were killed and 37 injured. Yet despite these numbers, the Occupation nevertheless remain largely invisible. In a series of articles over the next few weeks we will explore how Israel has accidentally or intentionally made the Occupation invisible to most Israelis whether they live in Israel proper or reside in settlements in the West Bank. In our first article we take the drive from Tel Aviv to the Dead Sea. This drive takes us through Jerusalem then eastwards along Motorway Route 1 inside the West Bank. This is a drive taken each year by tens of thousands of Tel Avivians, yet oddly it is not a drive that is readily understood as driving through an occupied West Bank. The drive to the Dead Sea along Route 1 east of Jerusalem operates in a kind of strange third dimension of occupying space. This is essentially ‘day-trip occupation’ whose geography is familiar to Tel Avivans, most of whom are likely to have taken this journey by car many times. This is a quintessential desert drive, a desert drive into open and empty and endless space, a kind of frontier geography evocative of American popular culture and US desert landscapes. The driving experience is more imaginary Arizona and Easy Rider than occupied Palestinian West Bank. Ten kilometres east of Jerusalem, beyond the vast suburban hilltop settlement of Ma’ale Adumim, begins the slow curving descent into open desert landscape, thus begins a journey that can be characterised as a form of leisurely drive-thru occupation. The recuperative properties of the Dead Sea ahead are reinforced with informative, fun-like tourism signage. The side of the roadway is dotted every few kilometres with reminders of the quick drop below sea level. The little blue mosaic tiles affixed to rocky outcrops appear with increasingly regularity – ‘250 Metres below Sea Level’, ‘350 Metres below Sea Level’, ‘450 Metres below Sea Level’. The few Bedouin encampments that dot the landscape, their goats an odd camel, add a nomadic, pastoral, almost biblical backdrop. Beyond the Lido junction where route 1 intersects with route 90, the remaining 50km southward journey settles into a kind of relaxed carefree occupation drive. This is a 50km drive of empty geography, free of obvious or any discernible interfering political reference. There are no Palestinians, at least no visible Palestinian towns, no minarets popping up over distant hills. Even the Bedouin have vanished. This is like no other drive across the West Bank. Unlike route 5 to Ariel (a settlement of 18,000 Israelis some 20km deep inside the northern West Bank), there is no barbed wire rolling along the side of the motorway. There is no motorway as such. The two-lane highway gently winds and bends, hugging the hilly and rocky terrain. This is a rugged, natural, desert mountain landscape. The open desert road is imbued with a sense of freedom – free of obligation, free of association, detached, a never-ending horizon. The road and drive ahead is slowly purged of any awkward memories and associations of a Jerusalem left behind, a Jerusalem of visible walls and barriers, conflict and segregation. It’s as if having passed through the real and metaphorical ‘pinch point’ of Jerusalem, whether having driven around or through the city, over or under the maze of flyovers, past the segregating walls and barriers, you have some- how escaped the oppressiveness of Israeli political geography. Perhaps it is the thought of the curative Dead Sea experience ahead, the anticipation of cleansing, bathing, purifying, that dissolves or absolves the political context. This is after all a life affirming, skin nourishing, chemical dissolving pleasure trip. The irony, of course, is that having escaped the overtly visible political landscape of segregation in the rear-view mirror, it is only in east Jerusalem that one enters the expanse of occupied territory. The Dead Sea Drive east of Jerusalem is, after all, also a drive through Israeli-occupied Palestinian West Bank. The illusion of ‘anywhere-ness’ is served by a subtle but complex sense of both absence and presence. The absence of a visible occupation, whether it be Israeli settlements or Palestinian towns, conveniently erases the underlying political landscape. This is a land- scape of the great outdoors, desert holiday geography. The presence of ‘the familiar’, the comfort of ‘the known’ exerts a powerful subliminal sense in striping this landscape of the Occupation. This is a desert drive inside occupied territory, but also an everyday holiday drive that is ordinary. This comfort of the familiar in a desert landscape is found in simple everyday objects in that landscape – the presence of the isolated but commonplace Israeli bus shelter; the ordinary and routine road signage in Hebrew. The road signage guides and channels. 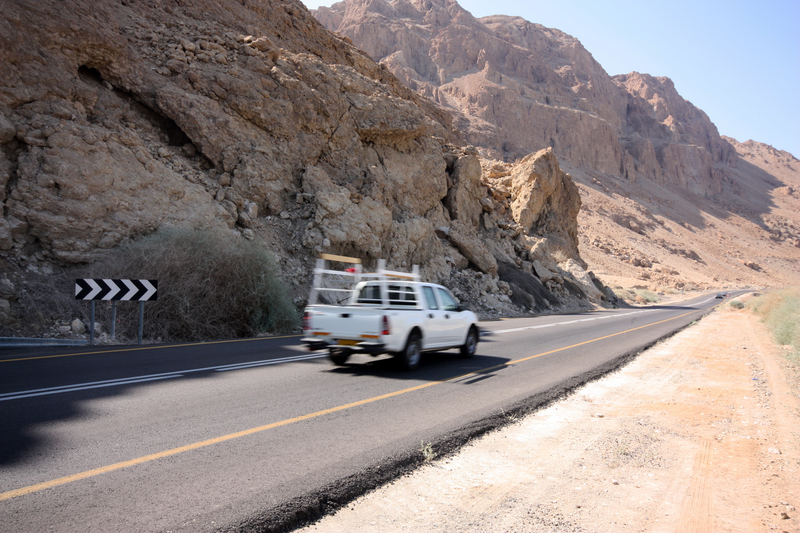 The Dead Sea Drive road signs are literally directional, providing recognisable and practical support. They also provide a psychological security – the State is here guiding me. The banal convenience of the roadside café and the road-side service station is equally important. Nothing could be more ordinary, more reassuring than stopping for ice cream or coffee at the Lido junction. The petrol station, shop and café located at the inter- section of route 1 and route 90 plays a critical, if somewhat unasked for, normalising role in anchoring the ordinariness of the Dead Sea Drive. This is the last petrol station before the 50km drive south along the shores of the Dead Sea. Stopping at the Lido junction is almost ritualistic. It is synonymous with refreshments, the last chance for a restroom pit-stop or stocking up on snacks for the road ahead. This is a safe place, a normal space, just like any other big roadside café-petrol station in Israel, and therein lays its peculiarity and odd familiarity. The Lido shop and garage is, of course, not located in Israel proper. This is the occupied West Bank. There are few, if any, other unsecured ‘open’ petrol stations or roadside cafés of this scale located 30km inside the Green Line, and none that feels so utterly devoid and detached of the reality of its location. This is day-trip geography, day-trip occupation. The Tel Avivian Dead Sea Drive is temporary; one’s presence in the West Bank is almost fleeting, a few hours perhaps just a few times over a number of years. Yet it’s the very ease of the ordinariness of taking the Dead Sea Drive that gives it a peculiar sense of detachment. For many day-tripping Tel Avivians, this isn’t political, it isn’t an exercise in occupation, and perhaps many would think it perverse to even consider it so. A drive to the Dead Sea through the occupied West Bank is not of course the equivalent of a conscious decision to choose to live in a settlement. It nevertheless forms part of a complex reality that informs the ordinariness of the seamlessness of the Israeli Occupation. It is this very ordinariness and seamlessness of the lived experience of the Israeli Occupation that we would argue psychologically anaesthetises many Israelis, including many Tel Avivians, understanding of the Occupation itself.